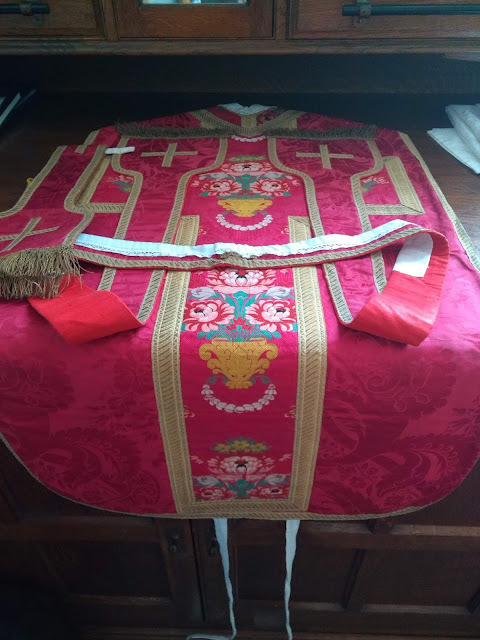 Last Thursday, Archbishop Kevin McDonald consecrated the chapel of my Alma Mater, the John Fisher School in Purley, on the occasion of the chapel's 50th anniversary. The chapel means a lot to me because it was there, at the early Mass before school, that my vocation to the priesthood took root. Following the example and encouragement of another boy, I began to get up half an hour earlier in order to get to school in time for Fr Nesbitt's Mass. That was what Our Lord wanted. 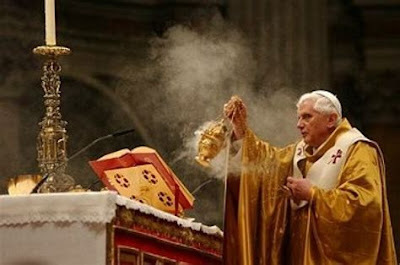 Here you can see the Archbishop putting incense into the burner as part of the rite of consecration of the altar itself. 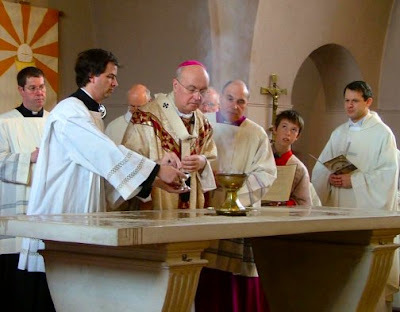 To the left of His Grace is Paul Moynihan with whom I served Mass when a small boy in the parish of Our Lady of the Annunciation, Addiscombe. Further left is Deacon Jim Sheahan who was once a student of mine when I was teaching theology to those training for the Permanent Diaconate. To the far right is Fr Stephen Dingley, an old boy of the school who has a doctorate from Cambridge in Astrophysics and who now teaches dogmatic theology at the seminary at Wonersh. The altar server in red completes the picture well with his demonstration of "The spirit of wonder and awe in God's presence." 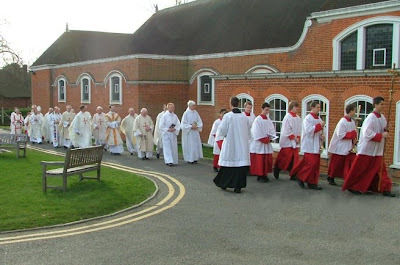 The next photo shows the procession before Mass and demonstrates that MCs in Southwark have perfected the art of walking backwards whilst keeping order. The picture was blessed by Bishop Howard at the end of the service. Recently restored to its full glory, it now hangs in the School Chapel. The origin of the painting is uncertain but it is believed to be Italian from about 1850. 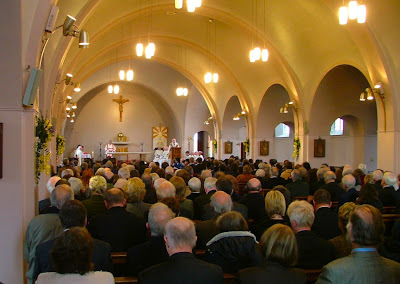 It had previously been hung in the temporary School Chapel that was always described as an "Army Hut". Having disappeared for many years, it was discovered in a battered state in a painter’s store at the preparatory school "Laleham Lea." 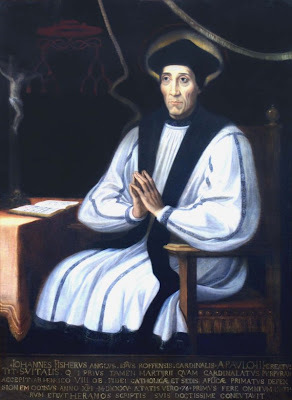 Sir Dan of the Nesbitry was there for the occasion, of course, and was proud to show Archbishop McDonald the board in the school hall which lists all of the old boys of the school who have been ordained to the priesthood. The Faith Movement was founded at the school in 1972 and many of the priestly vocations since that time, like my own, have grown and been nurtured within Faith.